It’s really simple, trust me! What you need here is patience, that’s all! I made two sets since there was 5 of us and each of us had one Rilakkuma!! It was actually my first challenge and there wasn’t any practice beforehand. See!! Now, you can trust me for what I’ve said which is “It’s very simple!!”. The ingredients used is the same as my previous Omelette Rice recipe which can be found here. 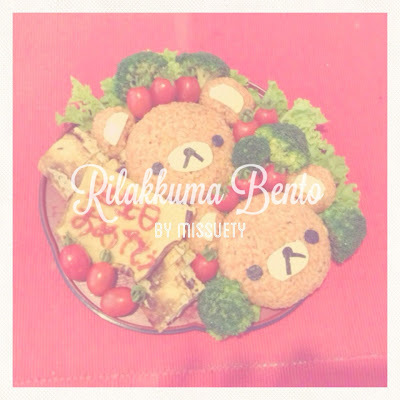 After cooking them, shape them up into the shape of that cute Rilakkuma and decorate them in any ways you like. For the decorations, I actually use mini tomatoes, broccoli, lettuce and also tamagoyaki.